With the magnificent sunrise and sunsets over mountains in the Eastern slopes of Sri Lanka lies the green lush carpets of tea. This is a long leaf OP tea with a bright coloured brew similar to a bright orange and a mild sweet flavour synonymous with UVA characters. As the harsh wind brushes through the tea gardens during July to mid August, the tea bushes close up to protect themselves from the wind, the result is a well concentrated, unique flavour which adds to the quality of teas grown in this region. Southern Sri Lanka known as "Ruhunu District" is surrounded by the beautiful Indian Ocean and extending into rain forests which provides its soils a unique combination offered by the surrounding of this region. Hidden amidst the world's most sought after beaches and tourist destinations are green silk spreads of tea gardens where some of the most preferred teas are grown, nurtured and plucked with utmost care. These low grown OP/BOP1 tea brews to a fair coloured , sweet liquor with a distinct low grown taste and a hint of caramel fragrance. Known as "Little England" in the hill country of Sri Lanka due to its cold climate and misty mountains, is the highest tea growing region in Sri Lanka. The breathtaking views and surrounding transports you to another time and place, reminding the charm and cold weather of a western or a European region. Nuwara Eliya teas are most sought after by connoisseurs and referred to as the "Champagne of teas". 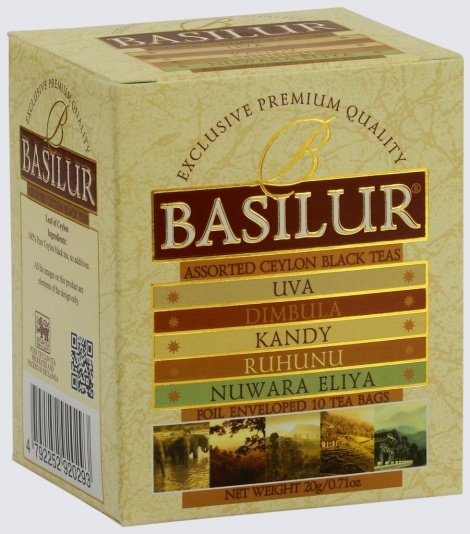 Basilur's Nuwara Eliya tea provides a deep red liquor once brewed together with the unique Nuwara Eliya characters.